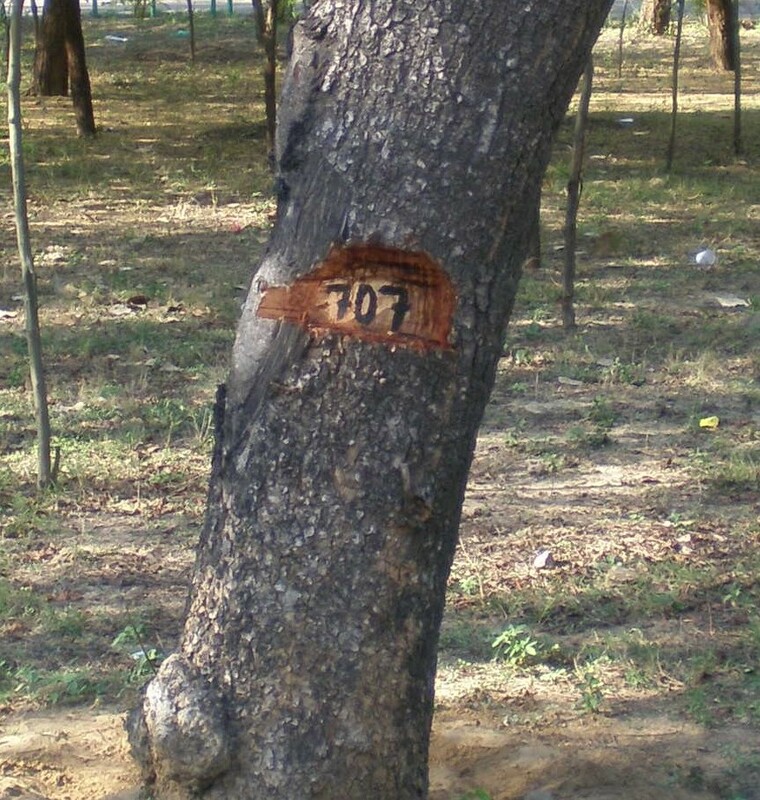 The carving of numbers on trees in the Delhi Univeristy Campus, which has been done around the Delhi University Sports Ground is (also) linked to the Commonwealth Games. Since the University Sports Ground needs to be expanded for some of the Commonwealth Game Events (which will be held here), the trees around it have to be removed. This is yet another Commonwealth Games’ vice – depriving us of our common-wealth: the green cover! Meanwhile, I had taken the following image some 2 weeks back. The exudates that are seen coming out are actually the food of the tree, which was to be transported from the upper part (leaves) of the tree to all other parts. It may be noted here that the numbering of trees is only done so that the trees can be cut in an organised way and some trees will not be hacked at all. 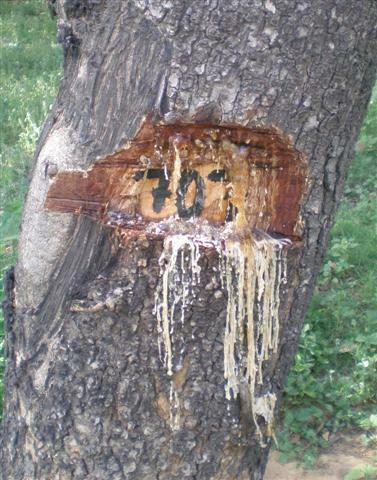 But, as can be seen above – the DAMAGE to the Tress has already been done. According to a Taxi stand owner at the (Delhi) University Guest House, whenever trees are numbered/labelled (at the sides of a road or otherwise) it is almost always because they have to be felled. The tree’s condition has even got worst now. I saw it while going to my hostel and the tree has not even flowered or borne leaves till now. this is worse than i thought….we must add this as a point to be raised…..in our trees for delhi campaign..
govind, can u kindly pl. take photo’s of other trees as well. n do a count of how many trees are numbered overall. clear location. species if possible. numbered by whom. For what, if you can know and post to treesfordelhiegroup. we could add it to areas we’re taking up..
Never cut trees only if necessary cut and then immediately plant another one near the surrondings or near your own house. Never forget that only trees can save us from death of suffercation. And by doing this you can even save one live. I am saying this only because i have expearinced this. Thus, always save trees!!!!!!!!!!!!!!!!!!!!!!!!!!!!!! !.